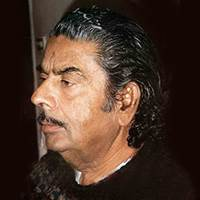 Akhtar Ali Rehmat was born on 30 September 1931 in Jammu. He was brought up y his mother in Bareily and Aligarh. Due to bad phases in his life, he could not continue his studies. He did many short-term jobs. Following this, he was appointed inspector in the government food department and later, got promoted to the post of ration collector. He had been interested in poetry since a very early age and his works were published in different Urdu magazines. He wrote under the pen name, Sehba and became Sehba Akhtar. He composed songs after getting associated with radio and entered the world of films. He had also been associated with the Herald for a period of seven years and his Qataat had been the highlight of Mashriq. He was involved in many aspects of literature. He composed more nazms in comparison to ghazals. His patriotic songs and dohaas were very popular. He passed away on 19 February 1996 in Karachi. Sarkasheeda, Iqr’aa, Samander, and Misha’l are collections of his works. He was awarded the president medal for his performance in literature.